Good morning. This is Alex Marienthal with the Gallatin National Forest Avalanche Forecast issued on Sunday, February 10th at 7:00 a.m. Today’s forecast is sponsored by Stronghold Fabrication and Map Brewing. This forecast does not apply to operating ski areas. This morning the mountains have 2-4” of low density new snow near West Yellowstone and Cooke City, and a trace to 1” near Bozeman and Big Sky. Temperatures are single digits to low teens F and wind is southerly at 15-25 mph with gusts over 45 mph in Hyalite. Today, temperatures will be single digits to low teens F with south to southwest wind at 20-35 mph. Near Bozeman and Big Sky light snow showers will drop 1-3”, and near West Yellowstone and Cooke City 4-6” is possible. In the mountains near West Yellowstone and the southern Madison and Gallatin ranges gusty winds formed fresh, thick drifts of snow on an unstable snowpack. These drifts can avalanche under the weight of a skier or rider and add weight to unsupportive, sugary facets buried 2-4’ feet deep. On Wednesday snowmobilers on Lionhead Ridge triggered a large avalanche that broke on this weak layer (details). On Thursday Doug and I saw this avalanche and three other recent slides (photo, video, details), and in the Centennials a rider triggered and was buried by a similar type of avalanche. His partners got him out quickly (link to video). Also, skiers in the southern Gallatin Range reported widespread collapsing on a shallow, weak snowpack (details). The weight of today’s light new snow is multiplied where southerly winds drifted this snow into thicker slabs. On wind loaded slopes, large dangerous avalanches can be triggered and are likely. On non-wind loaded slopes, large slides are possible and evaluating stability is tricky. Multiple people can cross a steep slope before one triggers a slide. Avoid avalanche terrain altogether, or rule out the presence of weak, sugary snow buried 2-4’ deep. Avalanche danger is CONSIDERABLE on wind loaded slopes and MODERATE on non-wind loaded slopes. Yesterday near Cooke City a snowmobiler triggered a large avalanche on the south face of Mt. Abundance (details and photos). This is the second human triggered avalanche reported near Cooke City in the last couple weeks, which is a relatively low frequency. Yesterday on Mt. Blackmore in Hyalite a skier triggered an avalanche 1-2’ deep and 200’ wide (details). These avalanches were triggered on wind loaded slopes and likely collapsed on persistent weak layers of sugary snow. 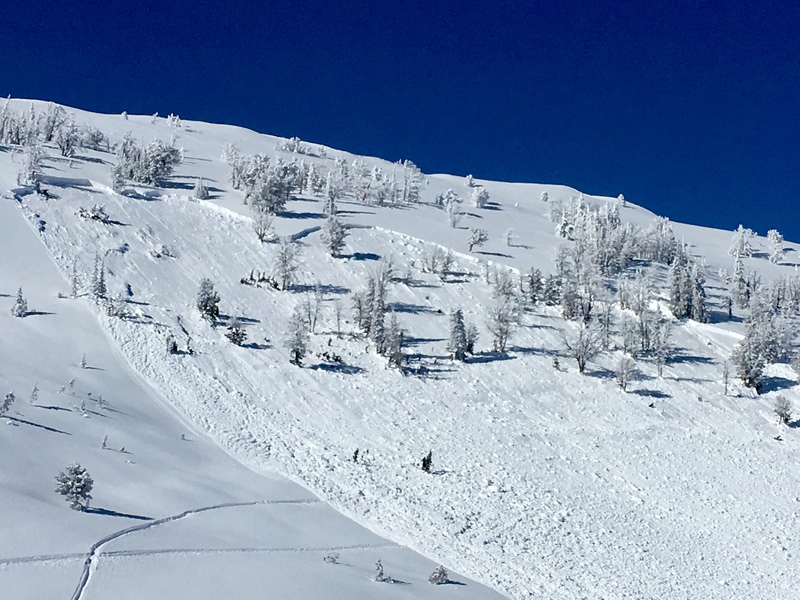 Avalanches yesterday are clear signs that unstable snow exists in the mountains near Cooke City, Bozeman and Big Sky. 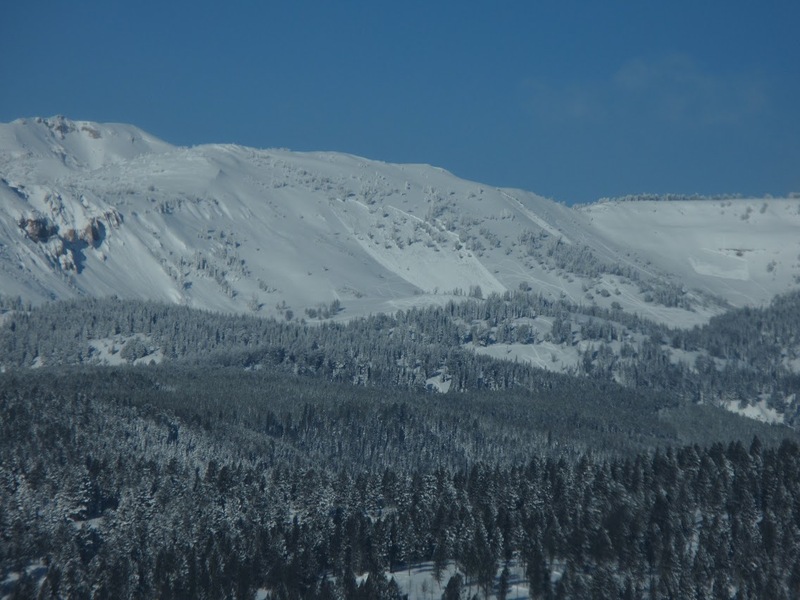 Unstable slopes are less widespread in these mountains than in the southern ranges and near West Yellowstone (video), and avalanches on persistent weak layers are getting difficult to trigger without much new snow. But, recent avalanche activity urges us to evaluate all steep slopes carefully. Dig 3-4 feet to evaluate snowpack structure and stability. Slopes that are most suspect are where the snowpack is less than 4 feet (video, video), or where depth changes greatly across a slope. Also be on the lookout for fresh drifts in unusual locations due to less common east-southeast winds yesterday. Today, avalanches are possible on wind loaded slopes which have MODERATE avalanche danger. On non-wind loaded slopes avalanche danger is LOW. Read an article in Backcountry Magazine by Mark Staples of the Utah Avalanche Center about why it’s a good idea to dig quick pits. This avalanche was triggered by snowmobilers on 2/6.